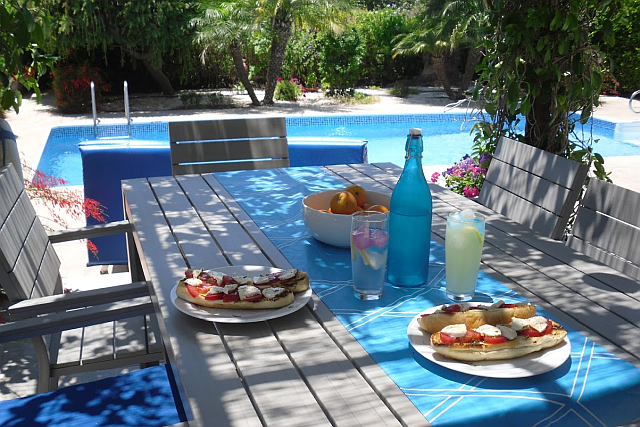 One of the delights of a villa holiday is the freedom of eating whenever and whatever you like – whether it’s a late breakfast, lazy lunch, evening barbecue or poolside takeaway. Our dining set comes with chair cushions so you’ll be comfortable lingering at the table and enjoying the view. 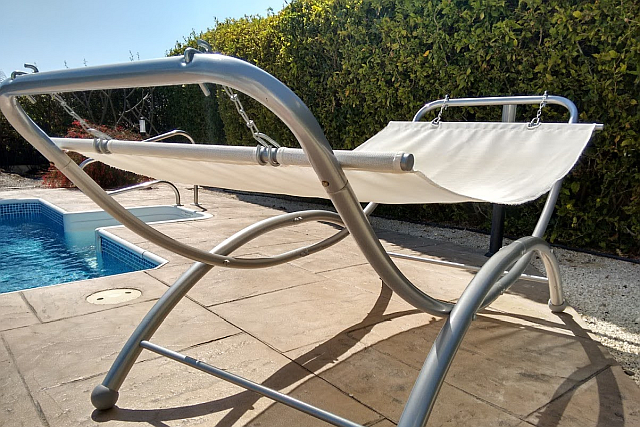 Another plus is topping up your tan from the comfort of your own lounger. Or taking a turn on the hammock. And cooling down with an occasional dip in the pool, followed by the fanning of Pissouri’s fabulous sea breeze – natural air-conditioning! 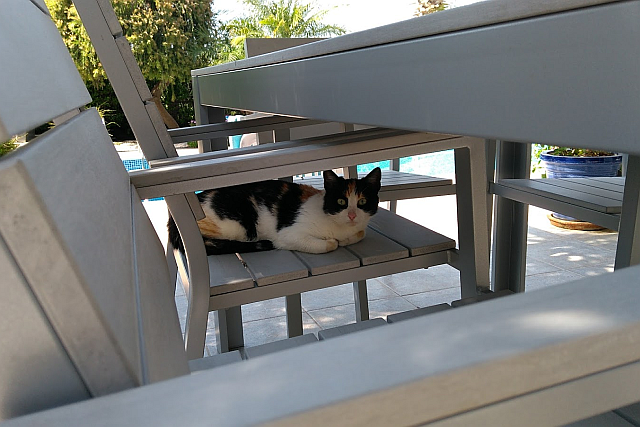 We also love the entertainment provided by sparrows, swifts, butterflies, lizards, and the occasional cat. 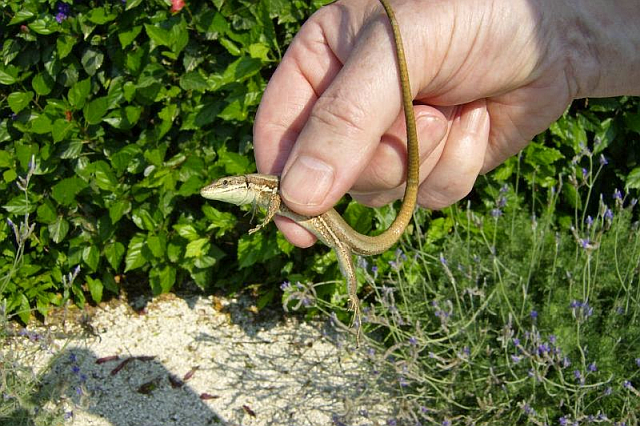 It’s amazing how much local wildlife enjoys visiting and exploring the garden. Many late afternoon hours have been spent admiring swifts skimming the pool. 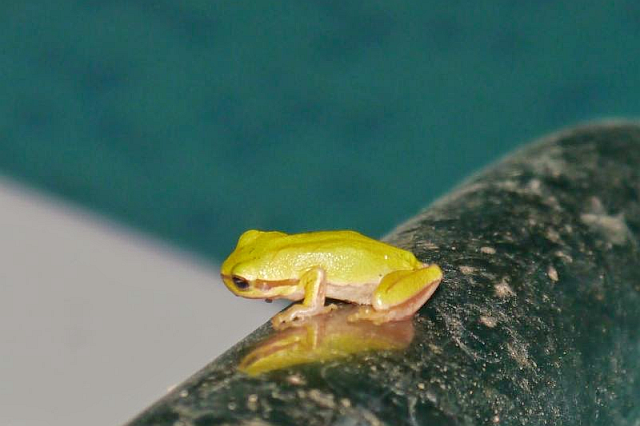 As for that tiny frog… he’s actually miniscule – in the photo he’s sitting on the pool hand rail – but his chirruping makes part of a pretty loud night chorus. 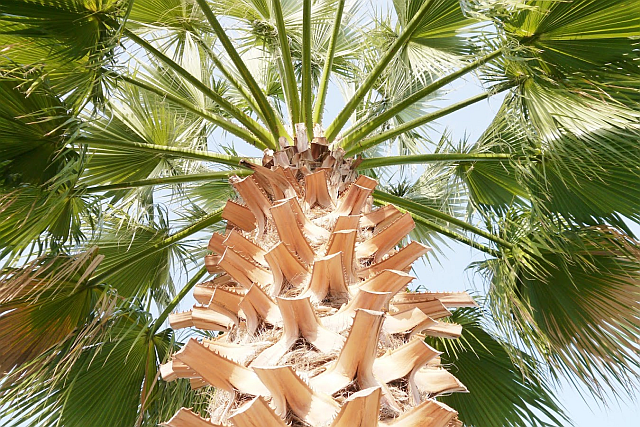 There’s plenty of interest all season long – from sub-tropical palms to flowering hedges and shrubs, and pretty patio pots. 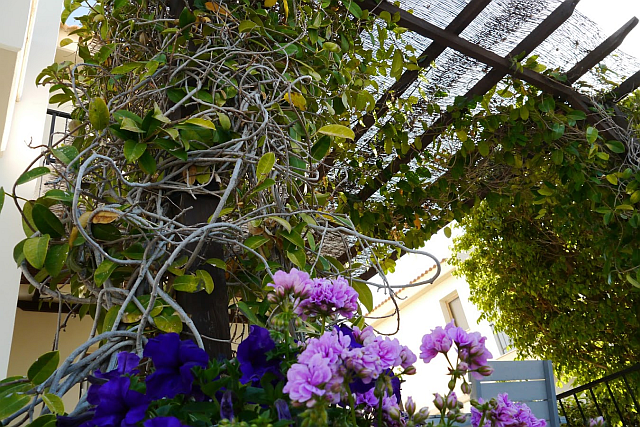 A softly-fragranced Stephanotis weaves its way up the dining area pergola, and a grape vine provides driveway shade. Given the history of the land, we just had to have a grape vine! And in the front garden, there are lemon and olive trees. It’s fabulous to be able to pick lemons fresh from the tree. We don’t recommend you try the olives though – they need to be cured in brine before they’re nice to eat. To the side of the villa there’s an Astroturf area that has quite a bit of daily shade making it ideal for outdoor family games. You can choose from Jenga, boules, skittles and Yahzee, or bring out one of the indoor board games. 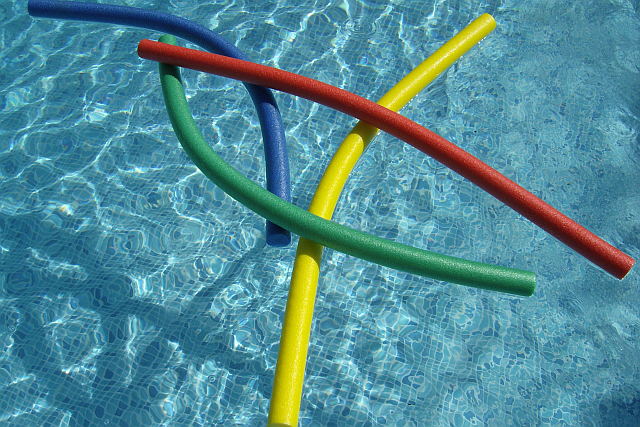 Having a great time – doing lots of activities at Chris’ Watersports. Just got back from the ruins at Kourion – thought that was spectacular. Your villa is perfect for us and the location is fantastic. So many lovely restaurants within walking distance of the villa and all of a very good standard. Recommend Hillview up in the Village for exceptional food and service and of course a fabulous view. We enjoyed our holiday immensely. A return visit is definitely on the cards sometime in the future! The villa is lovely – very clean, everything you need, gorgeous view around and beyond the pool. The living area and interior v cosy, stylish, home from home, enjoyed staying here. Clean, spacious and furnished to a very good standard, pool is a good size, lovely to sit out under the shade of the jasmine arbour. Pissouri Bay is a quiet, small and a more “upmarket” resort which still manages to offer a good selection of restaurants and water sports. Fav: The bunch of grapes restaurant Pissouri Village, great food lovely location and good service. For anyone looking for a relaxing holiday in great comfort and good food look no further than here. Just a quick email to say thank you for the use of the villa which we really enjoyed again this year. We tried the Kyrenia beach taverna which was excellent but found out that it is cash/cheque only! The owner was very kind and let us eat one day and pay the next – they are just so laid back in Cyprus, if only the UK was as kind! We had a lovely stay in your villa again. Our fourth visit – excellent as usual! We found a couple of new eating places in Kouklia, approx 15 minutes drive from the villa towards Paphos. The first night we tried Gabriel’s Tavern which was good, it caters for tourists! On our second visit the restaurant was full so we tried Efraim Tavern, which is next door to Gabriel’s. It is a tavern frequented mainly by Cypriots. The owner was very friendly and chatted to us about events in the village. The food was superior to Gabriel’s, too much to eat and very cheap! It was great to escape the busy tourist locations and to venture into more authentic Cyprus and to have the opportunity to engage with the locals at a different level. There are several more tavernas behind the main square, we only did only see this on the second visit as initially it looks like a very small village. Thursday night is Cyprus night – imagine it must be fun! Would definitely recommend to friends and family! We love your villa ! We love your villa ! How much do you want for it ??? Garden is gorgeous now it’s matured ! It’s like a home from home ! Sofas are nice too. Already discussing next year ! The villa was fabulous and we thoroughly enjoyed our visit, it was exceptionally well presented, everything went exactly as planned, thank you. One of the best presented villas we have ever stayed in. Just perfect for our needs. Spotlessly clean and stylish interior a real home from home. We felt very comfortable there. So well equipped it had everything anyone could ever want – even a pair of reading glasses!! We will definitely go back again next year. Thanks for the stay in the villa, it was superb. Definitely one of the best villas we have stayed in. The garden is very nice and the pool is lovely. Very well set out with the all the information, CDs etc. Thanks again, next time we are in Cyprus we’ll be sure to see if the villa is available again. Really enjoyed the villa, loved the location and thought that you are very thoughtful in all the touches and equipment in the villa. We found the villa very well equipped including the amount of local information. We hired a car for days out and for the days in we enjoyed the bay and the village. One restaurant in the bay was particularly good – Limanaki. Really enjoyed the place with the amazing views [Hill View]. We chartered a yacht while we were there and have left the details at the villa. We used your neighbours’ jet skis and had great fun and also went wine tasting. Just to say we have a really enjoyable holiday. Pissouri Bay was beautiful and your villa was absolutely gorgeous! The villa was so nice that 4 out of 7 nights we stayed in and ate. We will definitely return at some point. Would highly recommend it to friends and family. Very well equipped villa with all you could need (& more!) very clean and felt we were very well supported by Nikki. Thanks for everything we had a very happy holiday. What a lovely villa – everything you could possibly want and more. So much thought has gone in to ensure that you want for nothing. The villa is very well presented and has everything you could need for a perfect holiday. Pissouri Bay is a very friendly place with lots of good restaurants. The web brochure and our hosts gave us plenty of good advice and information. We will definitely return. Such a fabulous villa, everything we needed and the attention to detail to ensure all guests enjoy their stay was second to none. The location is quiet but perfect for the beach and short drive to the village. We ate out at all of the restaurants in the bay, all were good but our favourites were the Pissouri bay cafe and Kastros. Gorgeous house with brilliant kitchen stuff. Very lovely interior of all chambers and we really liked the pool. Villa stunning, home from home, all mod cons, beautiful. Want to take it home! Loved it. Pissouri beautiful place, just what the doctor ordered! Restaurants/tavernas all great, walking distance. Very comfortable… instructions brilliant. Very well equipped – toys welcome. Website gives a real feel for this lovely part of the world. Pissouri is a favourite haunt of ours. The village itself is a real taste of Cyprus. We loved Omodos plus Trodoos on a hot day as noticeably cooler. Melanda beach restaurant very good with lovely swimming in calm shallow water perfect for young children. Enjoyed Yialos for lunch. Sunday BBQ at Agamenon good… Androula is charming, everything cooked fresh, v rustic!! Favs: Agamemnon for adults, children love Captains Bay. Melanda for swimming and fish lunch or sundowners. Yet again we had a wonderful time, its just a shame to get home!! My sister didn’t want to leave. Once again thanks, hopefully be in touch for next year’s holiday. Just like being at home but with the advantage of a pool! Stunning! Just like being at home but with the advantage of a pool! Very well equipped, clean and organised. An extremely enjoyable holiday! Everything we remembered from our visit last year. The villa is lovely. A lovely quiet location walking distance from restaurants and local shops. 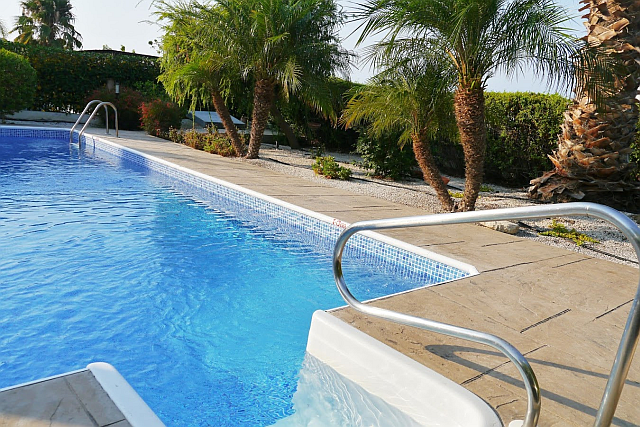 The pool area / garden is especially nice and perfect for lazy days and very tranquil at night with all the lights on when you return from eating out and want to chill before retiring. G did a diving course with Pissouri Bay Divers – they were fab. Returning in October for him to continue to the next level. For me the holiday was a crash and chill so I only ventured out to wander along the beach eat and visit the local shops in the Bay for supplies. I did however happen upon Bay Jewellery, Gemma is very talented and her jewellery is lovely, she is also keen to make any pieces bespoke. Kastros and Artemis remained our favourites from last year. With Yialos being added this year – the fish was amazing. Thanks for a perfect week. Just returned to the UK after 11 days in Cyprus staying at your wonderful villa. As many people have said the extras provided add value to the experience of staying on the Vineland development. Everything about the property and holiday was excellent; thank you. I can certainly see us booking in 2009 and will be in contact. 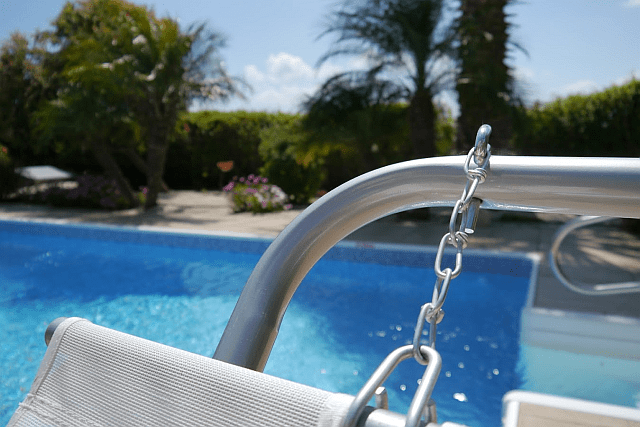 Great facilities – nice garden/pool. Everything is here if you forget something when packing! Pictures on website are true to the Villa. Perfect location to Pissouri Bay shops and restaurants. Need a car for village and bigger cheaper supermarket. Favs: Ampelli restaurant for lunch and dinner. Two Friends in the village for dinner followed by crepes in village square is always a must!! Saffron (Indian food Pissouri Bay) for a change to Cypriot food. A lovely clean and impressive villa, ideally located with everything needed for a perfect holiday. All the little extras included are wonderful. Its position giving the privacy wanted for a villa was ideal. Located in a lovely area of Cyprus with friendly people and lovely restaurants. Would definitely like to revisit. We had a lovely time and within hours of arriving we feel suitably chilled and at home. We have made so many friends since we have been visiting, even bumping into other guests we have chatted to on previous trips! Think I may have overchilled! We had a great holiday and the villa did not disappoint, it’s lovely. Car hire from Tarantos worked out fine and very reasonable. The hints and tips for eating out were useful Limanaki, Bunch of Grapes both fab. I hope we can return again soon. We had a great time, the villa was perfect for us and I think you have thought of everything. The villa handbooks were also excellent and easy to follow, all we had to do was relax and enjoy it. 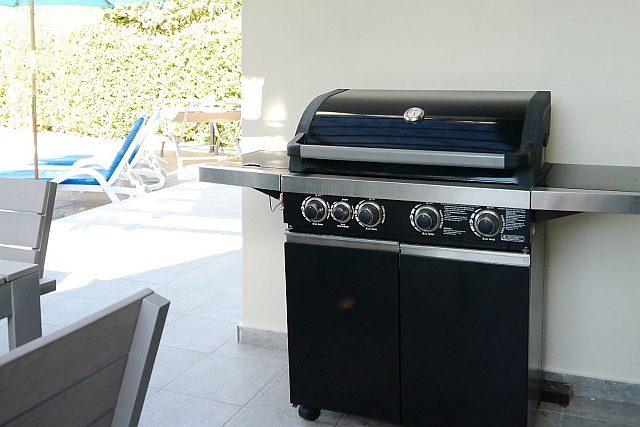 The BBQ was a joy to use as well, compared to our charcoal one at home, I think it convinced us to buy something similar for home. Really clean too so we would definitely stay there again. We had another wonderful holiday staying at Ampeli Villa, it’s a real pleasure to stay there! Your villa is so beautiful and incredibly well equipped. As usual I think we kept the Limanaki in business most nights! Hope to return to the villa soon! Clean, tidy, well equipped and everything in excellent order. Lovely pool and overall setting. Second time staying in Ampelli Villa, already talking about planning a third! Pissouri Bay offers everything you need for a relaxing holiday, lots of beaches and archeological sites nearby with good selection of restaurants and bars. Kastros in Pissouri Bay was our favourite restaurant, had delicious meals there, lovely views of the bay and friendly staff. We all had a fabulous week in your beautiful villa. We gave it a “Wow” factor on walking in. The weather, villa, swimming pool and the people in the village were all great. You have thought of everything that people need on holiday and much more. It was a wonderful relaxing week for all of us and we would highly recommend it to anybody. The villa was amazing, looked exactly as the photos on the website, the little touches such as games, cds, dvds were perfect for when we came in from our evening meal. The pool & gardens were also beautiful and the views from the upstairs balconies outstanding. All the information on the website was extremely helpful & Nikki was available with answers to any other questions I had. We didn’t hire a car so stayed in the local area. We couldn’t believe how quiet the beach was for August no fighting for space we practically had a whole stretch to ourselves!! Brilliant!! We got a taxi to the large supermarket in the village to stock up then just got bits from the 2 smaller shops in the bay. Our favourite places to eat were Yialos tavern (the best halloumi), Pissouri bay cafe and for value for money pizza venetto. We had a night up in the village which lovely to wander around. Our 2 girls enjoyed the inflatable rides at Chris water sports. Had a wonderful time yet again. My Mum, Dad and Daniel really enjoyed their stay too. My Dad was amazed at all the little extras you supply. A perfect holiday. We have eaten in virtually all the restaurants now. Panda Chinese is absolutely wonderful, wish we could have fitted in a second visit. Just a note to say how delighted we were to have our holiday at your wonderful villa. We were really impressed by how easy you have made it for people not to worry about the small things, as everything you need is available to you. Would love to return again. Villa perfect, everything you’d need. Very clean. Home from home. Pool is perfect too. Pissouri peaceful and quiet. Some lovely restaurants. Activity recommendation: Atlantis Boat Cruise – 2 h – saw lots of turtles from large portholes below deck. George v helpful. Swam from boat – great trip out. Everything you could wish for. Favs: Cocktails at the Hotel bar. Kastro’s restaurant. Kourion Archaeological site. Kourion beach. Farmers market produce at end of road. Our hosts couldn’t have been more helpful, and so well organised, an absolute pleasure to deal with. We had such a nice holiday! Your home is lovely! Everything was as we hoped, if not better. The Bay and Mo [at Chris Watersports] were perfect! She was fab. So lovely. The kids experienced stuff they have never had chance to and it was a perfect balance between relaxing and adrenaline. Thank you very much for all your touches. We will highly recommend you to our friends. Hope to come back again. The villa was really clean and well-stocked – a real home from home! Pissouri itself is quiet and unspoilt but with enough amenities to keep us and our two small children adequately supplied. A really lovely, relaxing visit. Hope to visit again soon. The villa was as perfect as always. Pool immaculate and very well maintained. Pissouri Bay great for casual dining and a few drinks. Kastro our favourite restaurant in the Bay area. Booking recommended. Perfect break as in previous years. Lived up to expectations and more!! Great location, facilities, all made for a wonderful holiday. Incredibly well equipped with quality all round. A stone’s throw away from the bizz of the beach area with ample choice of eateries etc, but also all you would want for a quiet relaxing holiday, quite simply a home from home. Returning hopefully next year for our fifth consecutive year to Pissouri and we will find it difficult to beat this great villa. Villa stunning. Much nicer than even the website showed! Everything we could need or want. Perfect. All you needed on your doorstep. Surprised at how lovely and quiet the bay is. Loved the village square. Fantastic! Clean, modern, air con, everything you could need. Impressed with the information booklet that was left. Beautiful lovely sized pool. Superb mother and daughter week away relaxing by the pool. Can’t wait to come again next year! Villa superb. Very comprehensive resources. Thoughtful touches. We really enjoyed our stay at Ampeli Villa. We had a wonderful time exploring the local area and just relaxing and enjoying the pool and garden. The villa was fantastically equipped and was a real home from home! Pissouri Bay was beautiful and we have come home with some lovely memories! I would highly recommend it to anyone and hope that we can return. Ampeli Villa is a beautiful home from home – films to watch, music to listen to and games to play when we weren’t enjoying the beautiful gardens and making the most of the lovely pool. Pissouri Bay is a quaint little hamlet with a lovely section of bars and restaurants, handy stores and beautiful beaches. We were able to pop down for a quick swim in the sea whenever we liked. Pissouri Village, up in the hills, is also a beautiful location that boasts the most breath taking mountain views. Its tiny cobbled streets are home to a lovely selection of bars, restaurants and tavernas and we really enjoyed the slightly cooler breeze that is to be found on the hillside. The children’s favourite part of the holiday was the day we spent a the waterpark in Fassouri. We also had a lovely day out to Omodos in the Troodos region where we were able to sample and purchase some locally made wine. A delight and an oasis of calm in a beautiful location. The facilities were exactly as described and you had thought of everything to make your guests’ stay easy and comfortable. The pool is great and we spent a lot of time enjoying your garden, the sun beds and the shade. Everything was in excellent condition. The villa is lovely. Good to have Netflix… home from home! Very well situated and well equipped. Perfect for a relaxing holiday. Lots of information on the website and inside the villa and the laminated maps of local areas were excellent. Well designed guest handbook of ‘how everything works’. We have been visiting Pissouri for many years and it is one of our favourite destinations. It is quiet and peaceful without the distractions of Paphos or Limassol though they are both within easy reach by car. Melanda Beach restaurant was excellent this visit and we always enjoy the Captains Bay overlooking the beach. On arrival: It’s perfect thank you ! 29 degrees not too busy in the bay. You’ve thought of everything here. On departure: Just about to leave the villa, we don’t want to go! Will be back as soon as we can. Thank you for making it such a great home away from home. 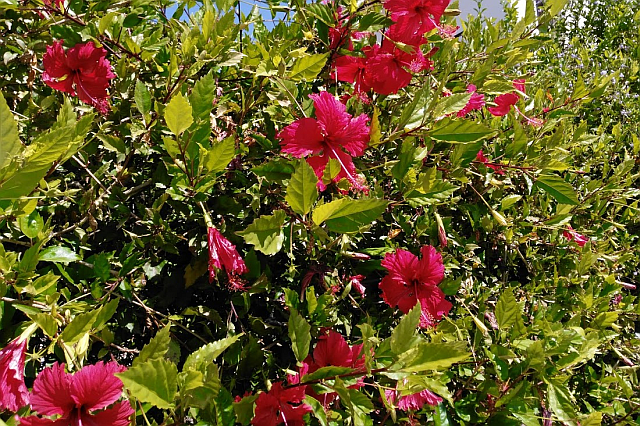 We’re familiar with the Pissouri area after spending the last two summers at the Columbia Resort but were very pleasantly surprised when we arrived at the Ampeli Villa. Its location was brilliant with everything apart for the supermarket within walking distance. The villa itself was great with everything as described on the website and the information provided by Nikki. All you would want for your stay was provided within the villa including films, games, etc although as usual the Cyprus weather didn’t let us down and so the time spent inside was minimal. The villa was clean, tidy and very well equipped and our holiday went without fault. 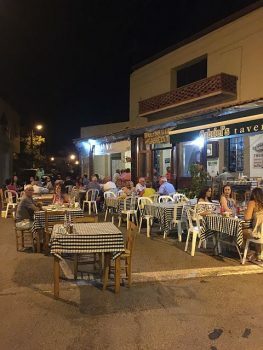 The local restaurants cover all needs and our favourites were Il Buchetto (with Andrea, George and the crew) and Kastro which was new for us but was excellent. Looking forward to next year! So easy to book. Beautiful villa, clean and well appointed. Information booklet actually informative! Great for all age groups to enjoy. Pissouri Bay is a lovely area and very accessible to other parts of Cyprus. We had a fabulous holiday, thank you. The villa is superb, everything you need for a restful holiday. Very clean and equipped very well. All the equipment and extras you could ask for. We would strongly recommend to anyone! Website, booking process and communication excellent. Information folder very good, gems of information. 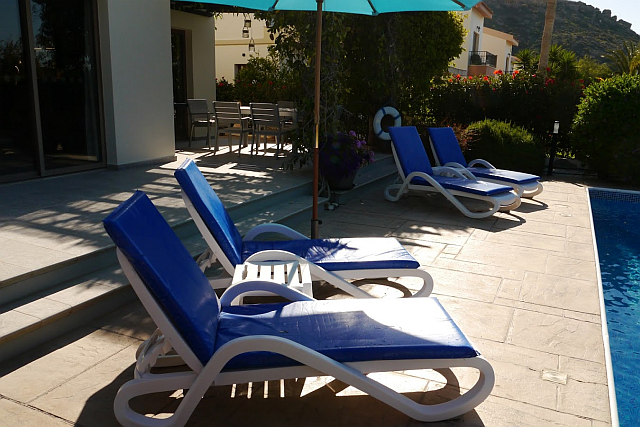 Pissouri Bay has everything you need. Great selection of restaurants, bars etc. Favs: Bay – Kastro (best moussaka ever), Saffron (Excellent Indian), Pissouri bay Cafe and Grape & Grain both excellent bars. 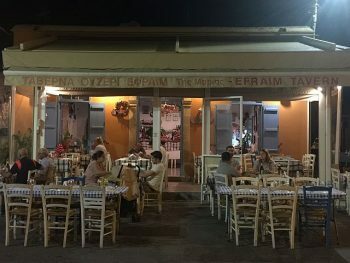 Village – great Cyprus night at O’Vrakas, Hideaway great food and location, Leon Sparti pub. Lovely as usual. Love the new cafetiere and solar lights above table. We had a wonderful time yet again. Excellent location close to the sea, with beautiful views to the bay. Hired a car and visited some of the old villages such as Omodos and Vouni where the taverns offer marvellous, traditional Cypriot dishes. The icons in the monastery at Omodos are a spectacle. A wonderful week spent in an immaculate villa under blue skies. What more could you want? The villa is as advertised and exceptionally clean. There was everything in the villa that you could possibly need, – it was like a home from home. 5 star villa. Pissouri is beautiful – never staying in Larnaca, Lemesos, Paphos or Ayia Napa again! Lovely villa – would recommend it to all our friends and family. Villa perfect for us. Everything you need. We loved the location, it was just what the”doctor ordered”. Favs: We adored Agamemnon’s cafe on the beach – we sat there for hours eating (food freshly made) & drinking. Have to say didn’t have a bad meal in any of the bars/restaurants. Also loved the first place on the left when you walk from villa [Vineleaf Tavern] – went to a Vietnamese Night there, it was great! We’ve had a lovely week and the villa is wonderful. We all thought it was exceptionally well furnished and the kitchen contained everything we could possibly need. With so much of the world to see, we rarely visit the same location twice; however, for your fantastic villa we may have to make an exception! What a joy. Everything has been thought of. Pool is lovely as is the villa. A feeling that you care about your customers (which am sure you do)! Excellent restaurants, water sports and really friendly people. Many thanks – it’s been an absolute pleasure. The villa is in tip-top condition and the luxury of one’s own pool, sun beds and a large shade, not to mention so many fine places to eat and drink by the sea within a couple of minutes’ walk, make for a dream holiday. The weather has been outstanding and we have been lazy. So much more than we could ever have imagined and the pool was a dream – this is the best equipped villa we have stayed in. This best holiday ever! We found Ampeli Villa to be very well equipped and clearly somewhere that you go yourselves as the extras included made all the difference. The villa was very comfortable and spacious and we liked the style and decor. All in all a good break in a lovely villa. Villa is well appointed with a high standard of finish. In an ideal spot within an easy 2 min walk to the restaurants and shops / bars of the bay. With peaceful neighbours its a perfect spot for a bit of R & R. Pissouri Bay is a small village with a cluster of 20 or so shops/ bars/ restaurants – we were impressed with the standard of service and food. Pissouri Village up the hill has a quaint feel to it and well worth a visit. Recommend wine route up towards Troodos (no need to go all the way – windy roads and breathtaking views) and a trip into Paphos (head for Port area). Fantastic Villa and Holiday. I hope we can return again soon. Post-stay: Stunning and really well equipped. Would recommend. Home from home, everything we needed and more, pool area is especially lovely. A lovely quiet bay with up to a dozen restaurants/bars and a few shops. Beach quite secluded and only a short walk from the villa. The Village – stunning views, traditional tavernas and gift shops selling handmade goods. Favs: Artima (fine dining Italian) in Limassol – for a special occasion. Il Buchetto in the bay – try the beef. Melanda Beach Restaurant for lunch – try the swordfish. Breakfast or dinner by the sea at Captains Bay. Cocktails in the Grape & Grain. I wish I was still there!! We have had a lovely time and are sad to be leaving today! Well equipped villa, everything in place to cater for your needs. Pissouri is a lovely place to stay, people very friendly and helpful with places to visit and best places to eat. Hillview, bunch of grapes, two friends, pizza venetto were our favourite places to eat. The grape and grain was a nice bar to visit. Great village square where you can eat and drink and mix with the locals. Delighted with the villa. Very clean, all facilities excellent, especially the pool. Having never stayed in a villa before, will definitely come back. Welcome pack great. Louise very helpful. Bedrooms great, plenty of room. We did not want to leave. Fantastic villa. Uninterrupted sea views and lovely secluded garden with beautiful pool. Lots of really thoughtful touches. Spotlessly clean, comfortable beds, a real home from home. Guest handbook with lots of information was a real bonus. Short walk from lots of bars restaurants and a couple of small supermarkets. Beautiful beach, lots of sunbeds and umbrellas along with jet skis, water skiing etc supplied by the lovely Mo. Pissouri village is beautiful very old worlde, traditional restaurants and bars. We loved the amphitheatre. Visited twice to see two tribute bands. Take a cool box and drinks. Limassol is lovely with a new marina, but also lovely parts of the old town to explore. We had a fabulous stay in the villa. We felt it was home from home. The villa had everything you could possibly need and the guide was very helpful with all the information you needed. We are very much looking forward to returning soon. The villa is ideal for walking to local restaurants and the beach. Our favourite places to eat at the bay was Kastro and the Pissouri Bay Cafe Bar. If you head up to the square I would recommend either the Hideaway and Stala Grill Corner. Definitely would recommend to all my friends and family. We were really impressed with the villa and its location. The quality and the amount of information that was provided in the guide book was clear and informative. We would definitely recommend the villa to friends and family. Spotless on arrival. Many thanks for “welcome pack”. Extras much appreciated. Our first villa holiday and very successful. Pool ideal. Breakfasts on terrace a joy. Will certainly return. Lovely villa with all the creature comforts. Perfect location close to local restaurants and the beach. The village is a 10 Euro taxi ride away – Hillview Restaurant and O Vrakas Taverna are recommended there. Coming back for sure. 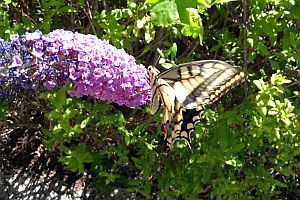 This is our second visit to Villa Ampeli and yet we could see further improvements which have been made by Nikki and Peter since our previous visit in 2016. This is a wonderful modern villa which caters for all of the needs of its guests irrespective of age especially families. Nikki and Peter have thought of everything that you may need to make your holiday a memorable one from the perspective of a villa holiday. October is a wonderful time to stay in Pissouri and the Bay Area and village were busier than our previous stay in July. (This may be down to the re-opening of the Columbia Resort). Our favourite places we visited were Melandra Beach (fresh fish), Agamemnon Beach Bar (views, chats, Cypriot home cooked food and relaxation), HillView (Nice treat) and Pissouri Bay Cafe Bar (hospitality and people watching). We will visit again and would absolutely recommend Villa Ampeli if you are considering a trip to Pissouri Bay. We arrived back last night after another wonderful holiday in Pissouri. Everything was as good as ever with the villa. The weather was as great ~ we think even hotter this year although the first few days were a bit overcast and humid with even some light sea mist in the mornings but after about 5 days this cleared up and became normal Cyprus weather hot and windy and wonderful. Just wanted to drop you a line to say how much we enjoyed our second stay at Pissouri Bay last week. The villa is so well equipped – you really have thought of everything to make anybody’s stay there a comfortable and memorable one. Looking forward to coming again next year. 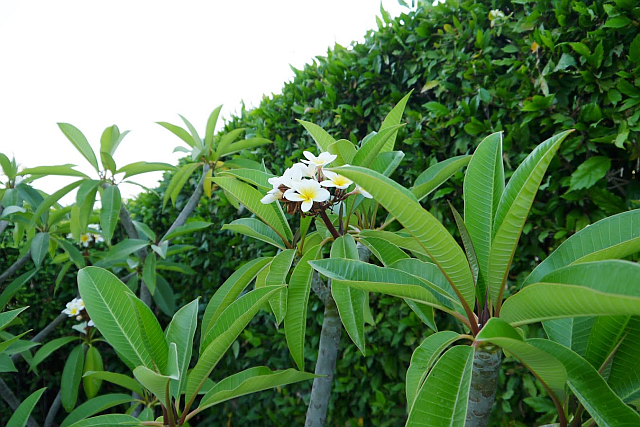 The villa is in excellent order, well presented and maintained. Very clean inside and out. Pool is lovely and has been thoroughly enjoyed by the four of us, could not get the children out! Returned after 15 or so years, more developed but still wonderful. Great beach, restaurants, people. Felt relaxed as soon as we arrived. Went to Artemis, good food and friendly staff. Columbia Beach Hotel for cocktails, pricey but worth it! Visited Kourion, well worth a trip, Paphos Archaeological Area fascinating with amazing mosaics. Limassol castle was interesting and we enjoyed exploring the old town. We have thoroughly enjoyed our week. Already talking about booking again for next year! Wonderful! Very well equipped, clean and comfortable. You’ve really thought about this from the residents’ viewpoint, so many clever and thoughtful touches. Pool lovely, just the right temp. What a collection of CDs and DVDs! The girls loved these for the car, and chilling out late evening respectively. My family of 6: 3 grandchildren, our daughter, my hubby and I have just returned today from a holiday in Ampeli Villa in Pissouri. I would like to say that we have never stayed in a villa that was as so complete as yours, we could not fault it at all. We had such a great time and the children 8yrs and 10yrs were so delighted with all of the little touches for them (the games). It was perfect, thank you and we would certainly look again to booking it and recommending it. When you arrive you are hit by the location, tranquility, space, layout and quality / cleanliness of the furnishings. With views of the sea, privacy from the neighbouring villas and proximity to tavernas and shops it exceeded all of our expectations. The outside space is fabulous and the gas bbq is great. You can see the sea and hear the waves some mornings. We particularly enjoyed the Vineleaf Tavern, Yialos and Agamemnon beach bar. We used Chris’ watersports a couple of times – they dropped us off then collected us from the local Kyrenia Beach where we stopped for a relaxing lunchtime meal. We would definitely stay again and recommend. We had a wonderful holiday and all was well with the villa. Looking forward to the next visit! Thank you we had a wonderful time, the villa was exactly how you described and perfect for our type of holiday. The villa is excellently equipped and everything was so easy and relaxing so we thank you for that. The children loved all the “little extras” and it helped to keep them entertained, very useful! 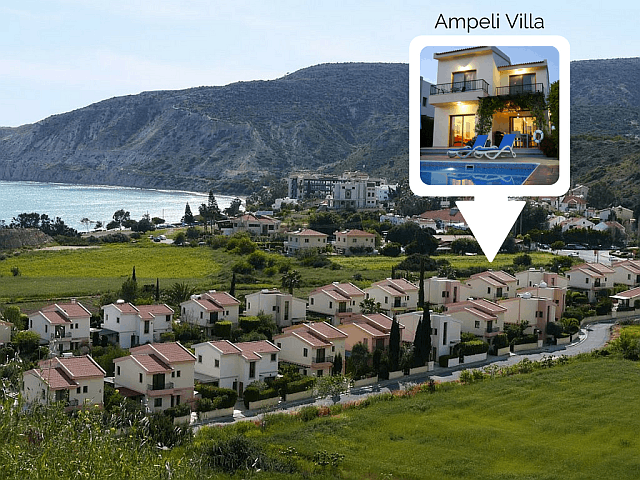 Ampeli Villa is beautiful, so clean, so organised and so homely. I’m positive this has been the most relaxing and fun holiday of my life. Janne [manager], the gardeners and pool guy are so helpful and friendly. We couldn’t have dreamed of a better holiday. Pissouri Bay is beautiful, lovely friendly people, great bars and restaurants and shops have all you need. We hired a car from a local business which came highly recommended. Great value and such an easy place to drive around. Very well appointed indeed. Sparklingly clean, bright and welcoming. Nice pool, stylish interior, feels very private. We had a wonderful honeymoon here. Amazingly comprehensive information pack. Answered all our questions and more. V useful restaurant recommendations. Bay is right on doorstep, friendly, nice beach few minutes walk. Got taxi into Village, hold on tight if Chris is driving! Village very pretty winding streets, holiday atmosphere. Home from home. Everything you need is made available. Poolside is excellent. Excellent information made available from first booking via social media and on the guest handbook. Pissouri Village , Melanda Beach, Kouklia are amongst our favourite spots. We also like Polis and Latchi. We really like Agamemnon seaside bar with its natural air conditioning , great views of the bay and fab local food. (Do not be put off if it is empty and there are no tables set out) the custom is to get your own table and chairs from the room to the side. Pissouri Bay Cafe is always busy and worth a visit. Michaels in the village is a bit of class and Melanda Beach is our favourite seafood restaurant. Spacious open-plan living / dining / kitchen with views through patio doors of the garden and pool. Master bedroom with king-sized bed and ensuite shower, plus twin bedrooms sharing the family bathroom. The two south-facing bedrooms offer panoramic sea-views from their balconies, the other provides views up the valley to the distant Troodos Mountains.